In September and October two typhoons made landfall in Japan and generally rainfall was higher than average over the whole country (link to JMA; in Japanese). In November, on the other hand, the weather was relatively mild. More severe weather conditions could be found in other parts of the world. This includes the continued high temperatures in Indonesia and Australia (summary by the Australian Bureau of Meteorology), and drought and forest fires in California (Drought.gov). As winter is starting to settle in, we take a look at the predictions for the season. Figure 1. Predicted surface air temperature anomaly (in °C; average December-February). The prediction was initiated on November 1. According to the SINTEX-F model, surface air temperatures over land will be above average over most land areas from December through February (Fig. 1). 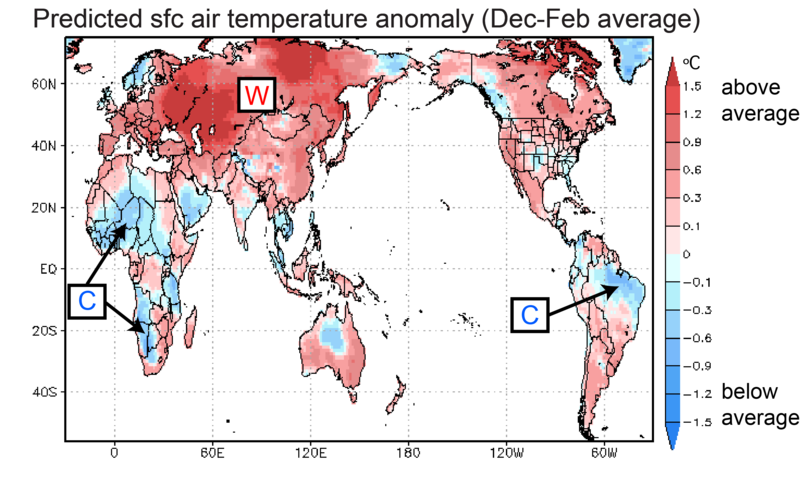 Cooler than average temperatures are predicted for northern Brazil and large portions of Africa. Figure 2. Predicted rainfall anomalies (in mm/day; average December-February). The prediction was initiated on November 1. The rainfall prediction (Fig. 2) shows clear signs of the continuing La Niña event in the tropical Pacific, where below-average sea-surface temperatures (SST) reduce convective activity and rainfall. Overall the map shows a rather complex pattern with many areas of anomalously low and high rainfall. Among others, the model forecast calls for below average rainfall over California, which would be bad news for the drought conditions there. 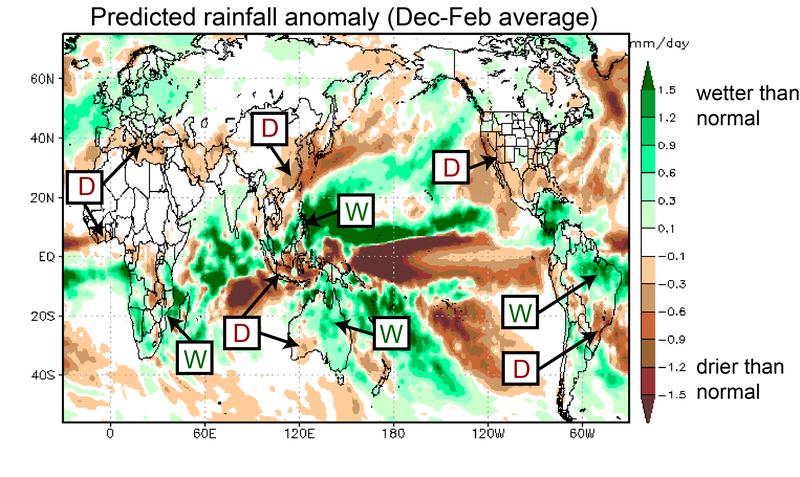 The model also calls for a wet season in northern Brazil and most of Australia, and for much stronger than average rainfall over the Philippines. 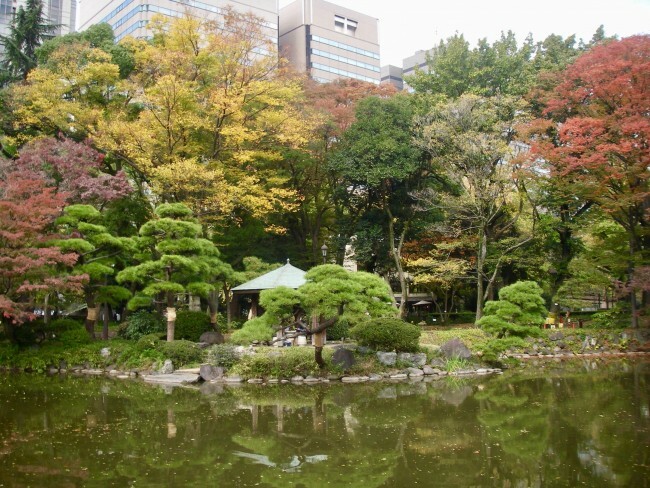 For Japan, the model indicates a warmer and drier than average winter. Please bear in mind though that the model’s forecast skill in the mid and high latitudes is rather limited. Figure 3. Predicted SST anomalies (in °C) for December-February. The prediction was initiated on November 1. The SST prediction (Fig. 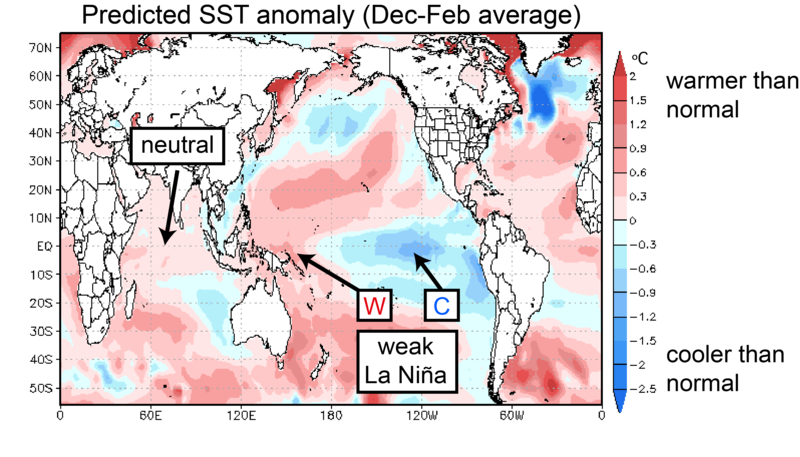 3) shows colder than average temperatures in the central and eastern tropical Pacific and warmer than average temperatures in the west, suggesting La Niña conditions will continue throughout the winter, though at a fairly weak level. The tropical Indian Ocean, on the other hand, is predicted to be in a neutral state in winter. Figure 4. Time evolution of the Nino 3.4 (upper panel) and IOD (lower panel) indices (in °C). The blue line show the observations. The predictions (initiated on November 1) are shown for individual ensemble members with perturbed initial conditions (grey lines) and their average (red line). Figure 4 shows the extended forecast for two SST indices of interest. The Niño 3.4 index is predicted to stay below -0.5 °C until April of 2018, indicating that weak La Niña conditions will continue until spring of next year (red line in the upper panel of Fig. 4), with neutral conditions expected in the summer of 2018. These predictions agree quite well with those from other prediction centers around the world (IRI ENSO Forecast). 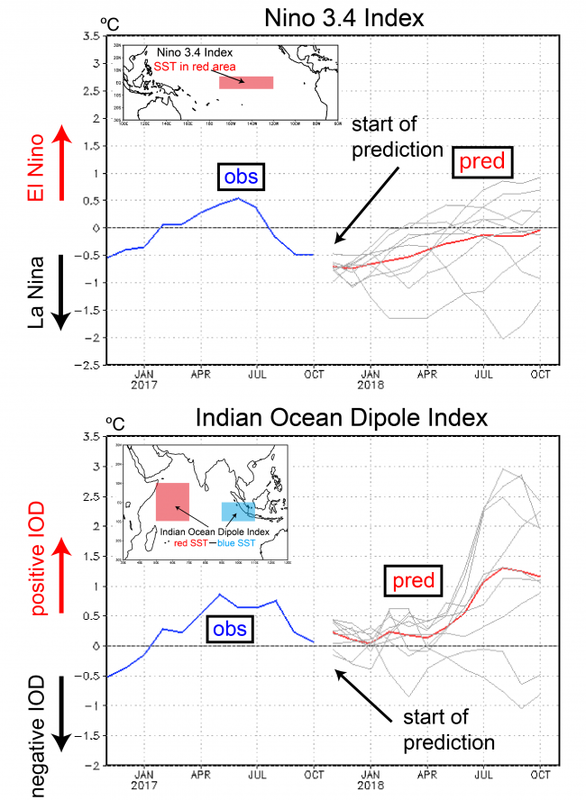 The Indian Ocean Dipole (IOD) index (Fig. 4, lower panel) suggests that a strong positive IOD will occur in late summer and fall of 2018. Note, however, that this prediction is rather far out into the future, and that the spread of the ensemble members is quite large. This suggests a high degree of uncertainty.